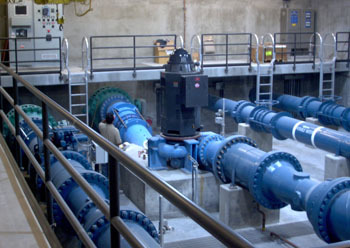 Canyon Hydro provides specialized hydropower systems designed to integrate with existing water supply (or waste) lines. Often called “conduit projects,” these systems take advantage of the excess pressure developed as water is piped from higher elevations. 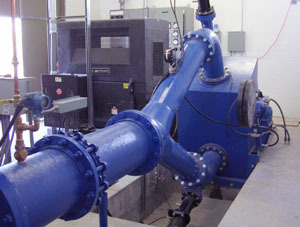 This Canyon Hydro Francis-type turbine sits inline with a water supply pipeline for the City of Logan, Utah. See the related magazine article for more information. Conduit projects commonly use a turbine to perform the function of a Pressure Reducing Valve (PRV). As with a PRV, a hydropower turbine reduces pressure. Instead of dissipating this excess energy like a PRV, however, the turbine converts it to usable power. While the concept is simple, conduit systems present special challenges and risks. Careful site assessment and planning are critical, and it is important to work with a supplier who understands the issues. Canyon Hydro has provided turbines and water-to-wire packages for several different types of conduit projects. We can offer useful advice for those considering an energy recovery system. Conduit systems can be a smart economic decision. With an existing water supply, most of the infrastructure for a hydropower system is already in place, including the intake, penstock, and sometimes even the powerhouse in the form of an existing vault. The relatively low incremental cost of the turbine means the system can pay for itself much earlier than an all-new hydro project. Similarly, licensing and permits can be easier to obtain because there is little or no environmental impact over what is already in place. In the USA, the Federal Energy Regulatory Commission (FERC) and a number of States have streamlined the permitting process for conduit projects. Not all conduit systems are suitable for hydropower, however. Keeping in mind the first priority is the reliable supply of water to consumers, - not hydropower - it is important to remember that the first priority is not hydropower; it is the delivery of water. Adequate safeguards must be in place to ensure uninterrupted flow to consumers. 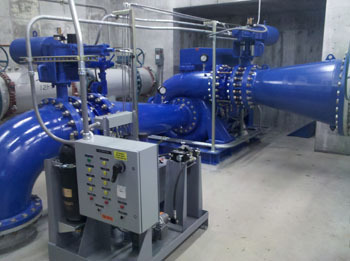 Canyon Hydro provided multiple Francis turbines to support this energy recovery project for the City of Las Vegas. One of the common risks with conduit systems is the conduit itself. Some pipelines were never designed to withstand the excess pressure that develops when the pipe is full and water flow is shut off. Add to this the risk of a pressure surge when the generator is tripped offline, and pipeline integrity becomes a major issue. Older, longer pipelines are most susceptible to damage from overpressure. A good time to evaluate a hydropower system is when an aging pipeline is replaced. A new pipeline can be designed with hydropower in mind, using modern design from end to end. Available Head Pressure: What is the water pressure at the turbine inlet when water is flowing? If there is an existing PRV in place, this is a good place to take the measurement. In many cases the water exiting the turbine also needs to be under pressure (for distribution to the community). The available pressure for power production will be the difference between the turbine inlet and outlet. In some cases it is not necessary to maintain water pressure at the turbine outlet. For this conduit system in Colorado, Canyon Hydro built a Pelton turbine to use all available pressure. Flow Duration: Flow is rarely constant on a public water system, so we’ll need to know how much flow to expect at various points in the day. A flow duration curve showing hourly flow over the course of a full day, week, or month provides very valuable information for sizing the hydro equipment. Remember that higher flows reduce head pressure, so a chart showing both is best. Pipeline Length & Diameter: The length and diameter will help us compute friction losses within the pipeline at varying flows. Any other details you can provide about the pipeline will be helpful. Electrical Requirements: Let us know what output voltage and frequency you will need from the generator. Line frequency is directly related to generator RPM, which also affects the selection of a turbine design. If you'd like to investigate the possibility of installing a conduit energy recovery system, we recommend you begin by filling out our data sheet. Be sure to add any comments that might give us more insight about the installation. We may ask a few more questions before suggesting a system, but we will be happy to provide you preliminary information to help with your assessment.